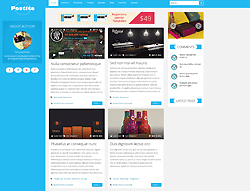 Postite is fully Responsive Joomla Blog Templates. It will help you create a News blog or News Magazine. Which included main features like Blog gallery, Blog videos, Blog audio and music play where you may integrate from other website videos, music's to in your blog site. It is a flexible Joomla! Theme built on helix framework from PCMShaper team. It comes with 10 different styles, some custom widgets for that style, Quickstart for you setup demo, K2 Blog, Bootstrap, Shortcodes, LESS and much more. Also it is the perfect combination between design and communication flow. This responsive Joomla template made for simple magazine, news portal, blog and corporate websites, and for your site.